Our collection of fragrances form Pelinsu Cosmetics sets a high value on quality and life period, and will create unique moments of well-being in your home. 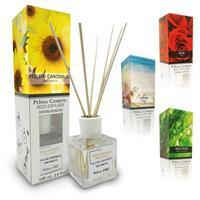 In no time at all these fragrances will create a naturally relaxing environment and long-living freshness. Each fragrance has its own effect, and you can use them purposefully to create specific atmospheres in our office, your bathroom or your living area.